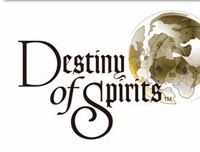 Ready to play the full version of Destiny of Spirits for your Vita? Get your friends list complete to make the most of the game. The Destiny of Spirits Beta came out back in October and it showed off some off its strategy RPG battles. Having friends around the world will help immensely with this game. Some spirits are region specific, but you can trade them with your buddies around the world to help fill up your spirit index. Seems like this title is up to help support the social aspect of the PSN. The game is also free to play. What do you think? Have you played the game yet? Looking forward to the release on the 25th?